Cockpit Hill (as it is known locally) represents the remains of a small motte and bailey castle, one of a large number in the area built on the banks of, or very near to, the River Lune. 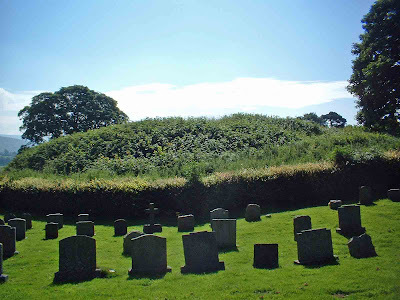 The above photo shows a view of the motte from within the 19th century extension to the nearby church's cemetary. From this angle, the motte's shape is clear cut....the damaged side is on the South side of the remains. 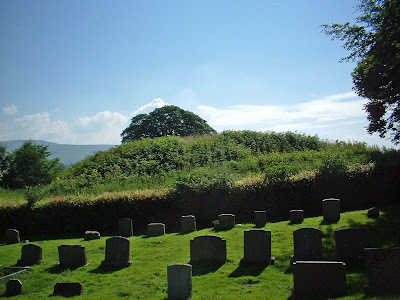 The castle remains can be found at the back of St Mary's church in Kirkby Lonsdale, on the Ruskin's View walk. The above photos shows the motte from the footpath, looking North West. It's highly likely that parts of the bailey area, as well as the defensive ditches and banks would have extended beneath the area occupied by the footpath. There is a high wall to your left as you walk with the river Lune below you on your right. Just beyond this wall, in the garden of the old vicarage, the overgrown motte can be seen. Another view of the motte from the church cemetary, looking South. There are two good vantage points. The first is from the graveyard at the back of the church. From here, looking over the wall, the full length of the remains can be seen. It is a long low motte, severely damaged and lacking all signs of the bailey. The above photo shows the motte looking North. This side of the earthwork has been extensively damaged. The other good view can be seen from the cemetery that adjoins the vicarage gardens. The remains can easily be seen over the hedge here. Close up, it's easy to see the height that the motte retains, some 7 metres high at its highest point. The eastern side of the motte is damaged, buried beneath the footpath, and by the erosion of the cliff face above the river. It's not clear where the bailey would have been, so many areas of the motte have now been built over or otherwise dug up and used as burial areas. One thing is clear. The North East corner of the current church, which only lies about 50 yards from the castle, was built on the site of a much earlier chapel. There is therefore the possibility that this chapel may have been in the bailey of the castle, and that the building of St Mary, and the demolition of the chapel, may have obliterated the original bailey. The remains are often attributed to Ivo de Tailbois, who also held the manor of Kendal, some 12 miles away. This motte and bailey, along with those at Whittington, Arkholme, Melling, Halton, Hornby and Kendal, represent the biggest concentration of motte and bailey castles outside of Wales.